She studied law at the University of Costa Rica where she was awarded a degree in Law in 2013. She worked as a litigating lawyer in criminal matters in the Supreme Court of Justice of Costa Rica until 2017. She currently lives in Madrid, where she is a student of the Master in Business Entrepreneurship at the Complutense University of Madrid. She has worked in international development and human rights organizations such as the Latin American Institute of the United Nations for the prevention of crime and the treatment of the offender, the Justice and Gender Foundation and the Organization of Ibero-American States for Education, Culture and Peace. Chosen and awarded a scholarship by the UN for the “Women for Peace 2017” program at University for Peace, Costa Rica. She works as a consultant in international law, human rights and gender. 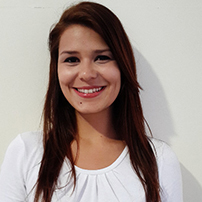 She is currently the executive director of She Is in Costa Rica, replicating the model of the non-profit organization founded in Colombia by Nadia Sánchez and adapting its application as a tool for leaving vulnerable situations to Costa Rican women, through entrepreneurship and Strengthening your business education.